Mercedes CL (2002-2007) - Car Reliability Index | Reliability Index | How reliable is your car? 9/02 An all-new CL arrives, in CL500 and 500bhp CL55 AMG guises. 10/02 The twin-turbo 5.5-litre V12 CL600 joins the range. 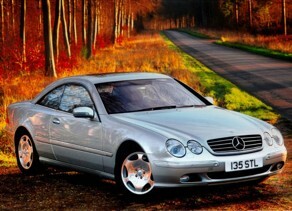 9/03 The CL500 gets a seven-speed automatic transmission. 4/04 The 603bhp twin-turbo 6-litre V12 CL65 AMG appears. Despite its size, the CL's cabin isn't that spacious, so don't expect to carry four tall adults in comfort for long distances. Being such a big and heavy car, the brakes have to work hard, so make sure they're not worn out. The car's size also takes its toll on the suspension, so check the car's handling isn't all over the place. Corrosion isn't unheard of; check the wheelarches and doors in particular. The CL is packed with electronics, and they don't always work. Check that everything functions properly; chances are you'll overlook lots of things because there's so much.